I've just come back from the question & answer session with John Frankland - the artist who is planting the massive rock in Mabley Green. Well - a couple of things: I don't really get the ART part of it all. It's just a rock on the lawn. And - it's not actually going to look like the leaflet Hackney Council have given out - actually it's going to look a lot different. But the good news is that it's BIG - and that we can do anything we want with it! Some of the excellent team at Mile End Climbing Wall (http://www.mileendwall.org.uk/) are going to put climbing hoops on the top - so that we can use ropes to climb it! And as we've already discussed (http://leabanksquare.blogspot.com/2008/06/mabley-green-boulder-by-john-frankland.html) - some of the people here in Leabank Square want to use it as an alternative solstice stone (instead of Stonehenge), some are going to have wedding, birthday, family celebration photo shoots at it, of course most of the kids are going to use it for footie target practice (pity there couldn't be two to make goals! ), we are going to tie a massive red ribbon around it for World Aids Day (December 1st), we are also going to attempt a maypole dance around it on May 1st (although the artists impression rock looked better to do it with) - and then - of course - we are going to climb it!! 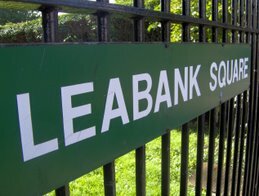 At least there is some positive spirit here in Leabank Square - there were a few grumpy residents from surrounding estates who were not too pleased to have such an amazing landmark in our local park! But - unfortunately - I was unable to find out how much of the £1 million that REAP promised us - was being used on this rock. There was no REAP person there (plus some health & safety fan was hogging the time) - but as promised - I'll try & find out how much of our money for local improvements is being used. Aaaaaaaanyway - it was great to meet John - even if I didn't get the art part. It's really amazing that such a well respected & admired artist is choosing Hackney Wick to site his work. PS: I found out that the rock took out a £51 000 chunk of the REAP grant. Whether that's cheap or expensive for art at the moment - I have no idea! Whether it cheap or expensive for quarrying a large rock & transporting it from Cornwall to Hackney Wick - again - no idea! Weather Hackney Wick could have had something better for the money? Plenty ideas!!! PSS: I am one of the worlds luckiest fellas in that I have a truly inspirational friend in Tom Cook (http://www.tom-cook.com/) - a wonderful human & artist. I had a cup of coffee with him yesterday and asked him to help me understand the 'art' in this rock. You know what - I sort of get it now. Tom's take (if I got this right) - is that John Frankland is actually a 'facilitator' of art - rather than an actual artist. He is gifting an object for us to use in any way we want to in the 'name' of art - but the art is what we actually do with it! Anyway - thanks Tom - I hope I haven't misinterpreted what you said - feel free to correct me by commenting - and thanks for the chat! Then I thought, heck we need many more 'rocks' here in the Wick. By that I mean - why don't we turn the whole of Hackney Wick into one giant art gallery! We could ask artists to donate their works to us by planting, hanging, draping, sculpting, anthining ALL OVER Hackney Wick! Time Out last week did a whole page on how many artists are deciding to work/live here - so let's get them all to start exhibiting their works right out in the open! I second you Dave, wouldn't it be lovely to take a walk around our surrounding streets, admiring (or scratching our heads) at works of art? Can we seriously start discussing this - possibly in the forum? What about a large green ribbon around it for St Patrics day? I simply Love the idea that Mabley Green will get a new attraction. I've heard about all the new developemnts planned for it, better changerroms, new astroturf, REAP landscaping, possible allotments, the new cycling centre, all very exiting stuff. The more people using it, the safer I will feel walking my dog around it. I go along with Dave's comment of "getting artists to exhibit their work in Hackney Wick", like an open spaced gallery for us all to be enthused and intrigued… but… as for this rock… this mini lump of Cornwall! Wow, what a colossal waste! According to the LDA; Hackney Wick "is an area that suffers from high unemployment rates substantial loss of local manufacturing jobs significant levels of vacant premises and sites high crime rate and a very poor image". So what's a solution? Spend Tens of £1,000's and stick a big stone in the middle of an open green space, and persuade the locals it's art… It's not art; it's a very lazy person's Stonehenge. If they wanted to erect a peeing post for dogs the park, they could have at least made it more discreet. If it was part of a bigger project, like what I believe they are doing in Shoreditch, then it would have a rationale; landscaping, benches, other features… but, abandoned on its own in the middle of some empty space it's like some sort of 2001 space oddity, only less interesting. That's it… I am officially confused! I've just seen the updated comment stating that the rock is being 'gifted' to us… in which case, why is it costing a share in a £1/4 million price tag? I was brought up to believe gifts didn't cost the recipient anything. The only amendment I would make would be to clarify that I believe his role in artistic terms for this particular project is that of a facilitator. He may consider this to be part of the essential role of an artist, and therefore it is a work of art in its original concept. Amongst artists this is a very subjective matter and he might not agree with my take on what he has done. The problem for me is that if it is actually art it probably would come under the heading of ‘conceptual art’ which theoretically could also mean that anything anyone imagines as a possibility could also be construed as art. It would be interesting to get any feedback if he reads your blog. I also went to this meeting & felt so very sorry for John the artist. ........ and all he got was some local spat between a disgruntled resident and some idiots from the council. There is a time and place for these kind of spats, but a 'meet the artist' meeting? COME ON people - don't be so rude!! The beef you have is with the council - don't hijack a public art meeting to serve your own needs. Go and knock on Hackney Town Hall's door if you want to do that. Did you see John Frankland sink lower and lower into his chair as the argument went on?! Show some courtesy & manners next time.